I found this in the gameroom yesterday while straightening up. It's about 3" across and has a clip on the back. It looks like it probably lights up. Anybody know who this belongs to? I thought this was a little bit odd (but still flattering). I found a cool trivia article on Battlezone, and one of the trivia items mentions me and my Battlezone animation. 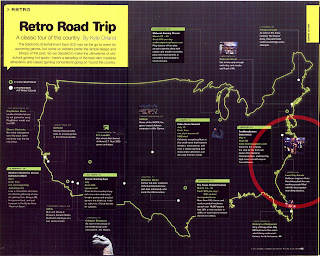 "It's 1980, And You're Commanding A Tank On Another Planet"
I am mentioned in the last trivia bullet. It's always thrilling to me whenever I find stuff like this. Here's a Youtube video that somebody posted of themselves playing my Atari Adventure 'emu-simulator-clone" Adventure: Revisited. The description of the video reads: "What is the best use of the extreme processing power of a dual quad-core Mac Pro? Playing Peter Hirschberg's port of the old Atari 2600 game "Adventure", of course!" Man, and all I can notice is how SLOW the game is running at that size window. I had a lot of drawing performance problems on the Mac port that I left unfixed. They were due to how OS X handles double-buffering to the screen. I need to switch the program to have it use OpenGL, which should make it blindingly fast on the Mac. Back in February I received an email from George Gomez. 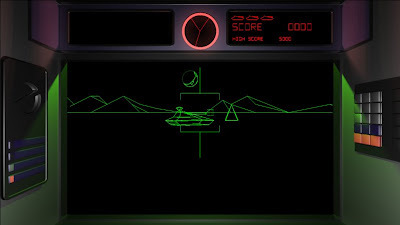 George explained to me that he had designed the cabinet for the coin-op version of Tron for Bally/Midway back in the 80s. Wow! He said that a colleague had forwarded my computer animated Tron short to him, and he was absolutely thrilled by it. I was so flattered! Over the next couple of months we sent a few emails back and forth, and I thought I'd compile that here as sort of a "mini interview". George gives some fascinating details here. I'll start things off with a vintage photo that he emailed me (click for a larger version). From the date on the calendar, you'll notice that this is from 1982. GG: I designed the TRON that you modeled and one of the guys at work sent me your movie. Awesome job! Peter: I grew up totally in love with the Tron cabinet. It's just gorgeous! That's why I decided to model and animate it. 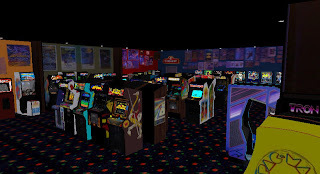 I've always considered the Tron cabinet to be the absolute pinnacle of arcade game cabinets - everything before just built up to Tron, and everything after went downhill. GG: What did you use to model it? I was blown away that you picked up the surface textures that I etched into the control grip. Talk about bring back memories. Also the vacformed cockpit looks like the real deal. I've been staring at the thing all day. Awesome job. How long did it take? Peter: The Tron animation took about 4 months to model and set up, and about 6 months of rendering time on a single Core 2 machine. I modeled most of the machine in Truespace, but the monitor shroud / cockpit and the joystick I modeled in Maya using subdivision surfaces. I'm trying to transition to using Maya exclusively, but it's challenging. GG: If you look closely at the wall behind me in the photo that I sent you, you can see my original storyboard for the light cycle wave hanging on the wall. Somewhere I have my hand carved original control grip. I will take pix and send them to you. Peter: And thanks for the awesome photo of you from 1982. I love stuff like that. I absolutely MUST blog about you on my site. GG: Peter, i'm working late on my latest game(NBA Ballers:Chosen One) for PS3 and X360, not as cool as the old days but its the business today. I'll definitely dig up some stuff for you. Blog away, I dont mind. I'm glad you guys grew up enjoying the work that's really the greatest satisfaction. 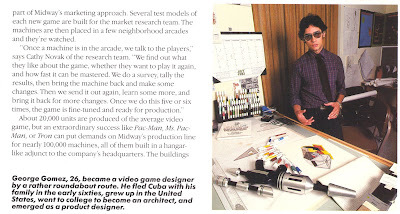 Peter: I was restoring my Gorf machine last week and found myself wondering if you designed the cabinet for that game as well. It definitely has a lot of similarities with to Tron cabinet. GG: I did the control grips, but not the cabinet. If you look closely at the red and black plastic insert on the back of the stick you'll find my name hidden in the red and black "pixel" array. The reason that there are similarities is that I started out with the basic Gorf shape when I mocked up the first one. GG: Yes, Gorf came out first. I had a Gorf cabinet laying around and I wanted to mock up the TRON cabinet quickly. The Gorf cabinet was designed by Dave Nutting. I designed the grips for Gorf and we were actually having a problem with the internal switch. I asked the molder to make me a set of clear grips so that I could see what was happening with the switch. I had those in my office years later when I started working on TRON. I was fooling around with a black light in order to get the cabinet to glow like the guys in the movie. I was leaving work one day and I turned off the lights in my office and I noticed that I had left one of the black lights on and I looked at the grips and they were glowing blue! So I turned right around and started working with the black light directly into the front of the control panel to glow the grips. The next problem was overcoming the fact that when you add UV inhibitors to the plastic for durability it kills the fluorescence of the plastic. So I worked with the vendor until we came up with a material formulation that was durable but still glowed. Peter: Ah, I love the details! That's great! Thanks so much! Let me know if there's anything I can ever do for you! Thanks again George! What a thrill! The Tron cabinet is truly one of the nicest video game cabinets ever designed, and holds a very magical place in my memories. UPDATE: I was asked to see if George could tell us what it was he was working on in the photo, above. His answer was: "Yes, turn the photo upside down and you will see that I was proposing that the company go get the StarWars licence. I am working on a sit down cabinet that looked like a TIE fighter. It turned out that Atari got the license. Also on my table notice the gun prototype. I designed that gun that for a space themed gun game that never made it. I took a standard gun handle and frame and made the scope, barrel and stock in order to change the look of it." 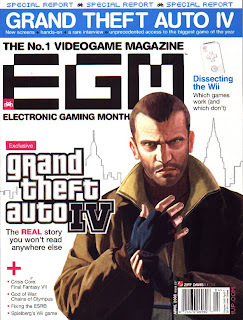 EGM ("Electronic Gaming Monthly") Magazine has a shout-out to Luna City in this month's newsstand issue. Thanks to all who pointed this out to me! WOW! I can't believe how many people came for the impromptu Game Day last Sunday! I'm still recovering from it. Something like 60 people were in attendance. The last of the guests left at around 10:30pm. Visitors were for the most part people I hadn't met before. It was pretty cool seeing so many people showing up in tshirts with Atari, Pacman, Space Invaders on them. It almost felt like a convention. I think the radio interview went well, although I'm a little concerned about my daughter being somewhat coached to say "my dad is crazy" on tape. Thanks. Jason Scott made it out again. He actually flew out just to be interviewed, and ended up arriving after the journalist had left. Sorry Jason! I wish the timing had worked out better. He did have this to say about the visit, and posted some nice photos of the event as well! I'm interested in any photos others may have taken. Especially photos of all the cars in the driveway!